How much better is a twintip that costs approximately a 1000,- euro’s compared to cheaper twintips with similar features? We tested the North Team Series 138*41 cm 2015 to get the answer. North produces a large quiver of kiteboards. With 10 different (in 2015) twintip boards to choose from it’s a good thing they have made an online tool to point you in the right direction. When you set this tool to “100% freestyle” it suggests 3 twintips; The Team Series, the Team Series Hadlow version and the already tried and tested Jaime. The first two are rated “wakestyle/freestyle”and the Jaime is discribed as a “freestyle/freeride”. You can translate this according to North’s theory as followed: the Jaime would suit most of the kiters out there plus it is 300 euro’s cheaper(!). So unless your name is Aaron Hadlow, Tom Court or you want to be participating in any freestyle competition it wouldn’t be the automatic choice to go for the expensive Team Series. That is why our main goal of the test is to see how far this theory is correct and if there could be any other reasons to still take the Team Series 2015 as your next board. While the 2016 North Team Series (photos from a trial in France, source: Kiteplus) are about to be released on the market, it may well be you find the 2015 for a reduced price soon. We rode the North Team Series 138*41 in several conditions in open sea. Although an important aspect of the board is to do freestyle and wakestyle moves with it, we did not focus on those capabilities too much. Most freestyle riders are experienced enough to have their own knowledge on which board suit their needs best. We tried to explain what we think on the North Team Series twintip while using it as an average kiteboarder. We already know from the Redbull Mega loop Challenge 2015 winner Lasse Walker the board is capable to be used outside of an freestyle competiton event and as seen from his Woo Sports results (over 15 meters) the Team Series is capable of going big. North has a choice of two pads/straps types (either the Entity or the Vario combo) or with the Pop boots. We tested the Team Series with the Entity footpads and straps which can be set at numerous positions; both the angle, the distance tot the rail of the footpads as the width stance can be adjusted due to the North Track system (which can be recognized by the 4 rails on top of the board). It is a really nice system which allows you to find your preferred setting without a doubt. 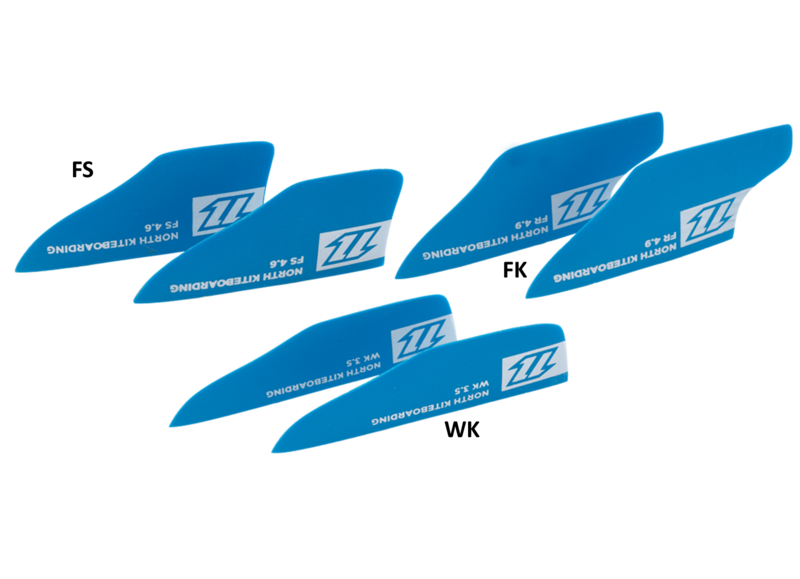 The board comes with Bend fins which can be chosen from three different sizes; wakestyle size WK (wakestyle,when riding with boots) and the more traditional FR (freeride) or FS (freestyle) fins. We used the FS fins. In theory those FS fins are a bit less suitable to carve through chop for example than the FR fins, but they will give a loser feeling and should be a bit more forgiving in the angle you land the board. The WK fins should be even more of this loose feeling and will let you even land sideways if needed. The Entity straps, to start with, are nice and give a real soft feeling. They are easy to adjust in size and should fit most sizes without any problem, especially the bigger feet (one of our testers has really high feet, and they really liked the Entity straps). As expected for a freestyle board is quite flexible. 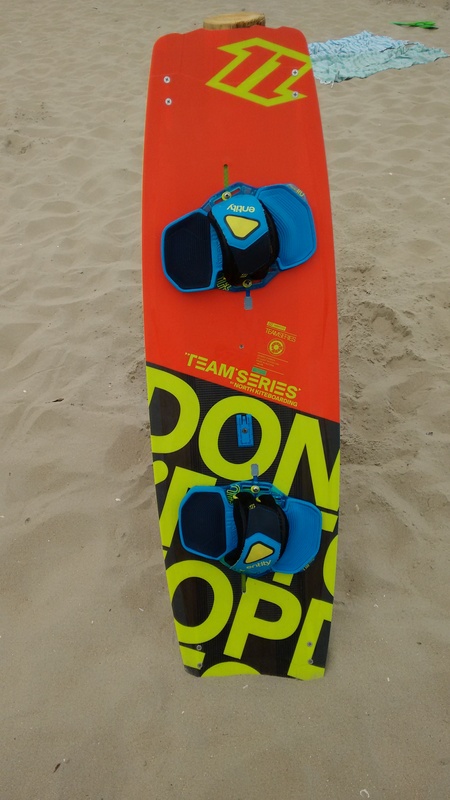 Almost as flexible as the -very flexible- F-one Acid carbon 2015, In combination with the FS fins and the Entity straps the Team Series is amazingly comfortable, not to say soft. The pop is, as expected, among the best we ever tested. It’s lightweight feeling really helps at this point. Landings are -due to it’s soft feeling- likewise; comfortable and as it should be. Compared to the Jaime it is a huge difference. Where the Jaime is quite stiff and on a track and won’t give such a comfortable landing, the Team Series is quite the opposite. At this point we decided to actually weigh several boards. We took a weighing scale and did some weighing of half a dozen boards (with dry pads and straps) . Surprisingly the North Jaime is a few hundred grams lighter than the Team Series. Several other boards, like the Ride Clash, the F-one Acid and Trax (all 2015 boards) weigh the same or even less than the North Team Series. Conclusion: the Team Series (and the Select even more) has a light feeling, but doesn’t necessarily mean it is lighter. Very Interesting when you think about it. Of course this won’t tell you how strong a board will be. There are some typical aspects from the Team Series you need to like. as the North select, the Team Series lies extremely loose -again probably due to its material used- on the water. It is far from being on a track (in our set up with FS fins) like the Jaime or the Ride Clash. It gives the board a feeling that it is very alive like a young dog that want’s to play all the time, but it can also be describe as being bounced around in choppy conditions. Another side effect of it’s lay out is the capabilities to go upwind and going full speed; these are not its best aspects. 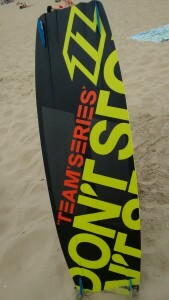 The Team series does have a quattro v bottom, which should help to get some grip to tack upwind, but it some how has too much curving in the board to make up for it. As for going up wind and for carving at full speed the Jaime is a lot better than the Team Series. Going for a Woo leaderboard score? The pop and the landing of the Team Series are significantly better than that of the Jaime. Sorry to say we haven’t been able to properly test the TS or the Hadlow. I think both of them can be used with either straps or boots. im about to invest in a new board, and im in between the Team series 2017 and the TS Hadlow 2017. any thoughts? are this board suitable for straps (specialy the hadlow)? are this board suitable for river chop? The Jaime comes in 2 versions now. The carbon one probably will break with your boots. I haven’t rode those ones, but in general you may say the Jaime is faster and will be completely the opposite from your Gambler. Especially the straighter outline (less rocker) on the Jaime give less comfort in the landings. I would take the Team Series. Hey Dave last question, I can also take a North Jaime 2017 but although it is not recommended, you can adapt Boots? thanks for the information ?? Yes a Gambler is quite slow, the TS will be better and more efficient. Although it is not a very easy choice, I think the 138 is indeed the better one. Mainly since you seem to ride in lighter winds. Hello Dave, I usually use a sail 12 and 9, as the table I have a gambler 136 of 2016 I use with Boots, however I feel that the trend slows me a lot so I wanted to become a single table and use it with both boots that with straps and I had thought about the series 138..comunque team 52KG weight are very leggero??? Hello guys, I would like to take a series 2016 team and use it with boots I weigh 52kg and 170cm tall, with us there is always a little windy so even this, and to count, what do you advise me a 138 or 135? thanks in advance and sorry for the English but use the translator ? No problem. That will be nice if you will do so. Thanks a lot for the advice and the prompt reply! I will send an update if I have the chance to try the Hadlow edition. I understand you are doubting. The combination of moderate winds and boots makes me advice to go for the bigger one. I did ride about 10 minutes on the 2016 Hadlow version, but it had normal straps on which is bit like testing a Formule one car on a normal road. So I cannot say much about it, sorry. Thanks a lot for the great review! I am thinking of buying a new board. Usual conditions are ~18-25 knots on a 10m F-One Bandit. Would you recommend the 138 or 141 for a 78-80kg rider wearing boots? Any experience with the Hadlow edition? It is a bit of a doubt between one bigger (141) and the 138. Mainly because I can see you kite in relative light winds (for example on a 12m) so my guess would be to go for the bigger one. If you are using boots for sure the 141.
thinking about buying TS 2015 as my only board. Would 138*41 cm size be good for 84 kg person? If not what size then. I am 50% of time on 12m and 50% on 9m Dice’s typically. Not possible to demo where I live.